In 5-quart saucepan, Dutch oven or stockpot, heat water and salt to boiling. Add corn; cook uncovered 5 to 7 minutes or until heated through. Serve immediately. 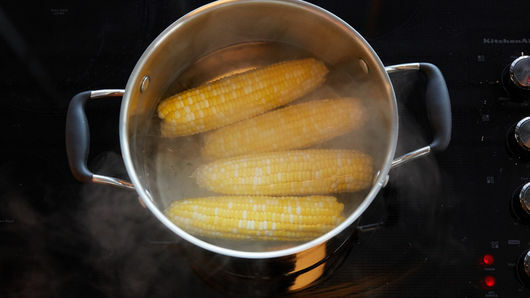 To add sweetness to your corn, 1 tablespoon sugar can be added to the boiling water. 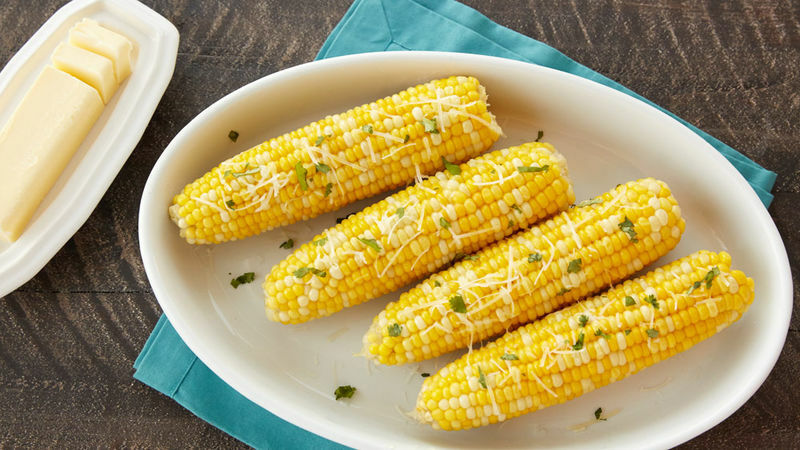 For a flavor twist, spread corn with butter, and sprinkle with your favorite fresh chopped herbs. Is there anything more quintessentially summer than corn on the cob? Whether boiled or grilled, corn on the cob is a beloved summer favorite at barbecues, fairs and even casual dinners. If you live in the heartland, you’re probably lucky enough to buy fresh corn on the cob picked straight from the farm at your local farmers market, but thankfully for the rest of the country, it’s easy to get corn on the cob at the grocery store. Not sure how to tell what corn on the cob you should pick? It’s easy to tell if an ear of corn is ready to eat by simply peeling back the husk and looking at the kernels. Is the ear well-filled? Are the kernels creamy yellow and white? You have yourself a perfect ear of corn. Just don’t pull the husk back too far—it’s a protective covering and you should keep it on the corn until you’re ready to cook it. Learn the history of corn on the cob and more tips for how to cook it by reading this handy how to cook corn on the cob article. Plus, make the most of corn and the rest of your summer veggie bounty by checking out all of our easy vegetable recipes.